Hi, I`m Viola! Someone brought me to a shelter, claiming that I just "flew into their back yard," but Mickaboo is pretty sure that they had been my owners and just didn`t want me anymore. People do this sometimes to avoid paying a surrender fee. 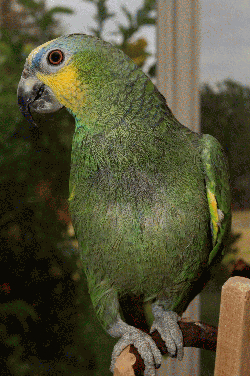 So, I`m an Orange-Winged Amazon parrot, or OWA for short. I look and act fairly young and, except for a few barbered feathers on my chest I seem very healthy. I`m eating my pellets and veggies like a good little Mickaboo bird, and I spend time out of my cage every evening visiting. The guy who sprang me from the shelter, who was also my first foster parent, had this to say about me: "Viola is a very typical OWA. She takes a long time to trust you, acts standoffish much of the time but is very gentle and easy-going if you respect her boundaries. She doesn`t seem to have a preference for males or females, so far, though she has worked mainly with males in Mickaboo. She will step onto a stick when she feels like coming out of her cage and onto a finger if she’s somewhere that she doesn`t want to be. "When Viola is comfortable she will sit quietly for hours and watch TV or the activities in the house or outside. She does like to be around people even though she’d rather not interact much of the time. Once in a while she will let me pet her head and neck. She will say hello and pretty bird and if I bark like a dog she will join in. She seems to enjoy that and it has become a bonding experience for us." I agree with most of what this guy said about me, except I`m rather embarrassed about the barking. Right now I want to go to a home where I can stay forever and not have to be ashamed of what I am. After what I have been through before coming to Mickaboo, I take my time to get to know people but once you are on my good list we can have great times together.